The importance of storytelling in wedding videography. South Asian wedding videography at the Merion, Cinnaminson NJ. Epic Indian wedding video trailer film by INZI Wedding Films. Check out the Pre-Release theatrical trailer for Leah & Connor's upcoming feature film at the Estate at Florentine Gardens, River Vale NJ. Theatrical Trailers are available as part of our "Pre-Release" wedding videography package upgrades. We love working at the Florentine Gardens, and we seem to end up shooting a lot of wedding videography there. One thing we always can count on, is that the lighting will be gorgeous, the ballroom will be amazingly decorated, and the staff plays like a true team with all of the visiting vendors. One of our favorite features about this venue is the string lighting in courtyard. At night, they act as beautiful accent lighting and just create an amazing background for our wedding videos. The "bokeh" behind your VIP's during their toasts or speeches really creates a gorgeous scene for your wedding film! Sometimes you just meet a couple who make the film for you and you won't even break a sweat. That's kind of how it went with Ashley & Chris. These two are just so in sync, and we mean that literally too! This was our first time at Batello's on the Jersey City waterfront, and were treated with some unique new scenery to work with. (The food might be the best we've had to date). Have a look at this couple's wedding highlight video, and give us a shout if you are looking to chat with us about your wedding videography needs! Breathtaking Teaser Trailer Film at the Rumson Country Club River House! Teaser Trailer ~ Kaylin & John ~ Hamilton Farm Golf Club, Glendale NJ ~ NJ Wedding Videographer. This was our first time at the Hamilton Farm Golf Club in Glendale, NJ. In fact, i've never heard of this venue prior to Kaylin & John bringing us on board for their wedding day. Let's just say that we were throughly impressed with this venue. It carried a ivy along all of its beautifully classic brick walls, and it felt like we were shooting this wedding in France at times. The classy vintage vibe of this place fit right in line with the vibe of Kaylin & Josh, and this teaser trailer offers just a glimpse in to the elegance of this couple and of their wedding day. Back again we were at The Pleasantdale Chateau for Marlenny & Marlon's grand wedding event. We had some brand new tools on the scene for this one, and we've been treated to some amazing results! Have a peek at this wedding teaser trailer, and stay tuned for the final feature film! INZI Wedding Films is a wedding videographer and wedding cinematographer serving the Philadelphia, New Jersey and NYC areas. We are also available for destination and other luxury events. Check out the teaser trailer for Melissa & Tim's upcoming feature film! We were thrilled to be back at the Rockleigh Country Club to shoot what is going to be one swell wedding video! The ceremony was set against a falling sun on a gorgeous day, and the slight breeze set the tone for a beautiful and heart-warming celebration of love. The Rockleigh is a terrific location and we always love shooting here. The ballroom is simply amazing and we are always, ALWAYS pleased with how beautiful this venue implements it's lighting. Never harsh, and always elegant. The Rockleigh provides all the right touches for some terrific wedding cinematography! INZI Wedding Films is a boutique wedding videographer, serving NJ, NYC, Philadelphia and also luxury destination weddings. We provide wedding cinematography services worldwide. We are thrilled to announce that we are now offering Drone and Aerial footage as an add-on to our cinematography packages. Flying a drone, even for wedding events, requires special authorization by the FAA. We took the time to get properly licensed, and are now ready for take-off. To practice our flying and shooting skills, we utilized a recent vacation to majestic island of Kauai, Hawaii to see what our machine is capable of. Well, the results were amazing. If you are already booked with us as your wedding videographer, feel free to ask us how you can add aerial cinematography to your current package! Kristen & David ~ Highlights Film ~ Appleford Estate, Villanova PA. Wedding Videography. Kristen & David's wedding was set against the beautiful AppleFord estate located in Villanova, PA. If you cry easy, well, get your tissue box ready. 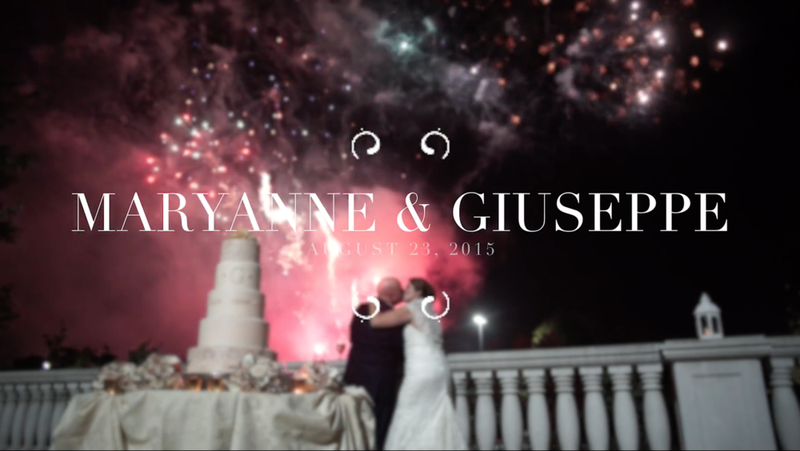 These two are profoundly in love, and we were honored to be there to create their wedding film. Under a gorgeous late day sun, Kristen & David shared their heartfelt vows. We loved the handcrafted props for the recessional (wedding tip!) and the string lights at the reception provided such a wonderful glow for all of the action of this garden themed wedding. INZI Wedding Films is a wedding videographer and cinematographer located in NJ, and servicing the New Jersey, Philadelphia, and NYC metro areas. Danielle & Stephen's wedding film is a reflection of this stellar couple. The bond between these two shines outward and bright, and the amazing imagery that we were able to capture reflects that beautiful bond. Against a backdrop of blue skies and green, well, greens.... watch two gorgeous lovebirds tie the knot! On a absolutely stunning mid-summer day, Marie & Mark tied the knot at The Estate at Florentine Gardens. This venue, nestled near the NY/NJ border, hosted an intimate wedding with the ceremony and reception at the same location. Mark prepped for his day at a suite at the Waldorf Astoria Hotel in Manhattan, a surprise for his bride later that day. A nervous groom fine tuned the details as he would see his bride at their first look just hours later. Marie, ever calm and full of smiles, prepared for her day among her bridesmaids. The Ceremony at The Estate at Florentine Gardens was beautiful and romantic. The open space sat at just the right angle from the late afternoon sun, enhancing the tender words from Marie & Mark's officiant. The Reception took place in the Estate's Ballroom, which is enveloped in large paned windows which let in the beautiful setting sun. When day becomes night, the sparkle of the string lights outside creates the most magical environment for a wedding reception. We were treated to a FANTASTIC display by a trio of belly dancers, who entranced the audience in a display of swords and lights. It's a day where a couple so deep in love shared their vows and committed to act other for an eternity, and it was an honor to be there as their wedding cinematographer to capture their day. INZI Wedding Films is a NJ Wedding Cinematographer serving Philadelphia, New Jersey, NYC and weddings worldwide. We were thrilled to be back at The Palace at Somerset for yet another amazing shoot. The Palace has always been one of our favorite venues for their excellent coordination and simply beautiful ballroom. Working with Maryanne & Giuseppe was equally beautiful and we captured some amazing footage from a big party with a bunch of high-energy Italian folks. The fireworks display is a signature offering at the Palace, and we were able to incorporate some of the amazing cinematography. Getting married at The Palace at Somerset too? Give us a shout if you would like to inquire about our NJ Wedding Videography services for your wedding day! 2016 Winner and Hall of Fame! We are extremely excited to announce that we have once again been selected as a winner of The Knot's "Best of Weddings" awards in wedding cinematography. We are extremely grateful for all of our success and we could not have done it without our couples, so this one is for you! And, there's more! This has been our fifth year in a row winning a Best of Weddings award, and as such, we've also been inducted in to The Knot's "Hall of Fame". These past five years have been an exciting journey as we have honed our style of videography, and we are excited for all the new things we are going to be implementing for 2016. Same Day Edit! ~ The Park Savoy, Florham Park, NJ. One of the craziest undertakings for a wedding videographer, is delivering a same day edit for a client. Just as the name implies, we were just crazy enough to shoot and edit this beautiful short film that was ready in time to show at the cake cutting during the reception! In all seriousness, this isn't that crazy... we've developed a system that allows us to deliver a full featured package, and still create one of these for our clients. For us, it was truly exhilarating to see the crowd go wild after the final shot. Contact us to learn how we can create one of these for you! Jackie & Mark's wedding at one of our personal favorite venues, The Pleasantdale Chateau, was a day to remember. Basically, a bunch of folks hopped the pond to see a bride perform The Notorious B.I.G. 's 90's classic, "Juicy". And a few other things happened too. Sometimes, dreams happen while we are awake! Another terrific shoot at the Rockleigh Country Club, Kawsar & Mark shared their story in an intimate affair with family & friends. Click play! All music licensed and used by permission. INZI Wedding Films a wedding cinematographer based out of NJ, servicing NYC, Philadelphia, The Hamptons, Washington DC, Baltimore and destination weddings. Specializing in premium wedding videography, INZI Wedding Films are award-winning cinematographers creating unique and compelling films. Stephanie & Jason shared their vows and celebrated their vows with a BIG gathering of family and friends. Two lovebirds with gentle demeanors, the love these two share is genuine and easy to see. From a truly intimate wedding beneath string lights, to a grand and festive reception party, we were there to capture it all! Produced under Collection 3 All Music used by Permission. INZI Wedding Films is a NJ Wedding Cinematographer and NJ wedding Videographer servicing the NJ/NYC/Philadelphia metro areas. We also are a destination wedding cinematography studio. We are thrilled to announce that we have been selected for the third year in a row, as winners of both the "Best of Weddings" and the "Bride's Choice Awards" in the Cinematography/Videography category! It's been an amazing year, and we wanted to take a moment to thank all of our couples!